Project Entropia is a new online multiplayer VR universe. There are a bunch of those already, with many users. But now see this Business Model. Several of the others have economies where one can buy and sell items for some internal virtual currency. But in this one they go a bit step further. One can convert the currency back and forth from normal currencies, like dollars and euros. And people can set up businesses inside the world. There's a stock market, there are casinos, there are stores, you can buy a house. Most everything is for sale, or is convertible to real money. So, if you find a hidden treasure, you can go and cash it out. My son Zach, who's quite a veteran in some of these games, told me about it. He and some of his friends were plotting how they could finance their playing of the game. The game itself is free, but you need some cash for buying things you need in the start. If you're successful, you might become self-sustainable later of course. But now they were exploring money making ideas they could find elsewhere on the net, like being paid for looking at ads. Maybe this kind of thing just becomes another clever way of relieving subscribers of their money. Or this kind of virtual/non-virtual economy starts something new that somehow is meaningful. If nothing else, making teenagers think like entrepreneurs. If the economy is a little slow in the meat world, and there's unemployment and prices are rising - can you then drop into a virtual world and start creating value there instead, and feed that back into the real world? It's an idea. 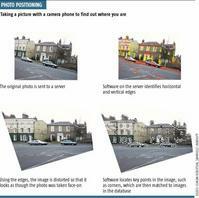 New software can figure out where you are positioned based on analyzing a photo in near real time. Simply send it a photo from your camera-phone and the software will match the image to a database of locations -- such as buildings in a city -- and give you back your coordinates. The software is potentially more accurate than GPS. That's cool and interesting of course. But would I pay for it? Or even bother to go through the steps of taking a photo and e-mailing it? Probably not. If it were all automatic and free it would be a different matter. If an always-on camera continously was scanning my surroundings and could tell where I am and what I'm looking at, that might be something. And then I'd probably have more use for a device that did it with faces. E.g. I go to a convention and it would tell me which people I already know, but have forgotten.